Vintage cars from the 70s, 60s and even earlier are all about the looks. Back in the mid-90s after the car had established itself as the future of transport, manufacturers focused heavily on aesthetics to make their models appealing to the masses. This artistic approach gave us some of the prettiest cars to ever grace the roads – the Jaguar E Type, the F 250 GTO, and Aston’s DB 5 just to mention a few. The front of the car gives the first impression and acts as its face, with the headlamps, grille, windscreen and side mirrors. This is where attention to detail matters, and so it's vital that grilles are intricately designed to match the car’s presence and complement the rest of the body. Replacing an old, damaged or rusty grille set might just be what your vintage car needs to reclaim its former beauty. Unfortunately, the problem with restoring vintage cars is finding the original replacement parts to maintain their looks. Car manufacturers rarely produce vintage spares. The only way to get a perfect-fit grille for a vintage car is a custom build. Here are two essential facts you should know before ordering grilles for vintage cars. It is vital to match or surpass the original build quality of the grille. Grilles are not just for aesthetics; they also protect delicate components like the radiator and air intake system. So, don’t prioritise other features over quality and practicality. Most vintage grilles were made from steel or occasionally from aluminium. Aluminium is lighter and stiffer but only comes with a brushed finish. Steel is stronger and heavier; a Zunsport stainless steel grille comes in two possible finishes – black nylon or electropolished. The cost of a grille is mainly dependent on the car. The size, material, finish, and design all influence the final price. The cost may also include additional parts that may come with the grille. Grilles are easy to fit and can normally be done at home with only a screwdriver. While choosing a grille manufacturer, the first thing would be to check for credibility; are they experienced in this type of work and can they deliver a high-quality product? Secondly, check that they have the necessary material for the build. Finally, it takes artistic and practical craftsmanship to develop grilles; ensure that the manufacturer can guarantee a replica in exquisite detail. Zunsport is an experienced manufacturer of grille sets for popular modern models as well as vintage cars. We build strong, resilient grilles that are designed to endure all road conditions and last as long as your car. 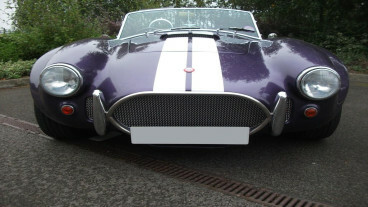 Contact us today and preserve that rare vintage car look with a brand new grille.